It’s been awhile since I wrote about books. I didn’t realize how many of you actually like to know what I’m reading, what my kids are reading, and what my students are reading! I’ll start with my reading pile. 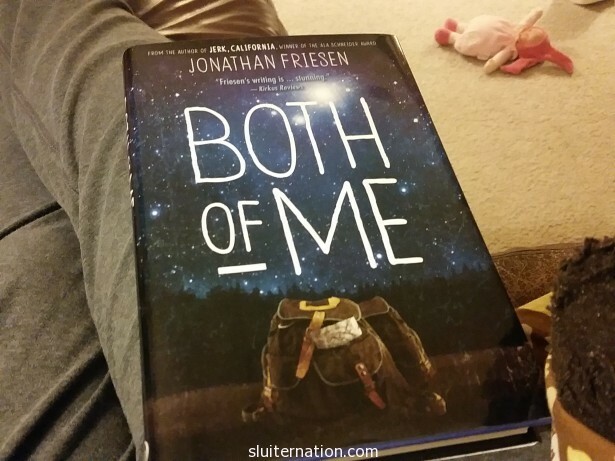 I’m currently reading Both of Me by Jonathan Friesen. He will be the visiting author at our school in January, so I am teaching this book in the next few weeks. I’m pretty excited about it because it’s so different than any book I’ve ever taught. Clara and Elias are randomly next to each other on a flight to the United States. On the flight, Clara tries to strike up a conversation with Elias and realizes that he knows something about her past–something she is trying to keep hidden in the past. After they part ways, she realizes their backpacks were switched, and when she brings his back to his residence, she realizes that the Elias she met on the plane is not the same Elias that greets her at the door. We just had Eddie’s parent/teacher conference this week and found out he is meeting benchmarks that surpass first grade in both reading and math. The kid loves learning. 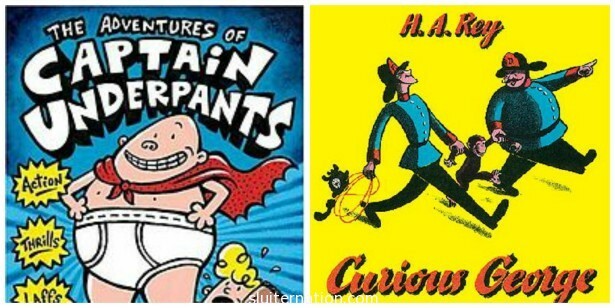 We had two Captain Underpants books at home and these have now become Eddie’s favorite. We have read three of the series so far (numbers 1, 3, and 4). Eddie has put the rest on his Christmas list. I’ll be honest and say I think they are pretty dumb, but they are silly and they keep Eddie interested in reading. Charlie tries to listen to the chapter books at bedtime, but is usually uninterested if there are not pictures on the page. He usually picks from our enormous pile of picture books. Eddie also chooses books from his school library that he thinks Charlie will enjoy. This usually means we read a Curious George book at bedtime too. It’s interesting to watch my students are reading. There are certain books and series from last year that were wildly popular that just haven’t been checked out much, but there are others that collected dust last year that have been constantly checked out this year. 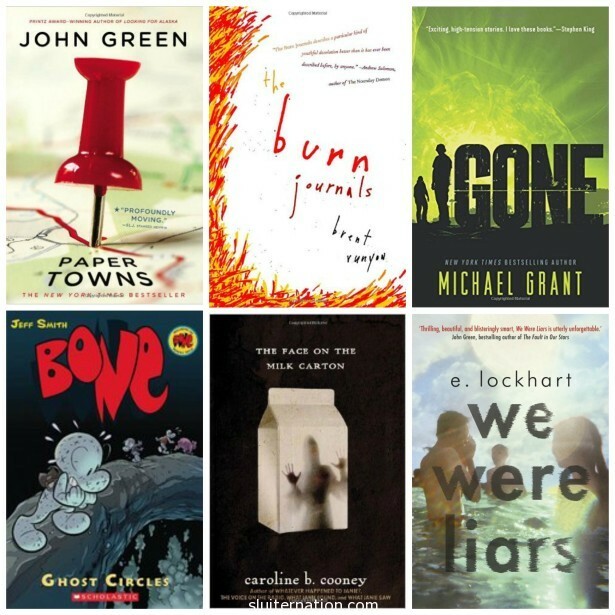 Paper Towns by John Green – Ok, I mentioned this one before. But it’s hugely popular right now because of the movie and because Looking For Alaska is pretty similar, that one is always checked out too. The Burn Journals by Brent Runyon – This book was new to my library this year and my students discovered it in the nonfiction section before I could read it. It’s a memoir about how Runyon attempted suicide as a teenager by setting himself on fire. Gone (the series) by Michael Grant — Once kids have read through The Hunger Games and Divergent series they want something new. In this series, all the adults have been wiped out leaving only kids, toddlers, and babies to fend for themselves. Bone (the series) by Jeff Smith — I really know nothing about this series because the minute I put it in my library it was all checked out. All of it. Reluctant readers (mostly boys) flock to this. The Face on the Milk Carton by Caroline B Cooney — This actually a series too. I got it because this year I have quite a few reluctant readers who asked for mysteries. Since they were not big readers to begin with, my Agatha Christie was not appealing to them. I needed something YA to get their attention. Because of the popularity of this one, I just added the next in the “Janie Johnson Series”. We Were Liars by e. lockhart — Ok fine. I mentioned this one before too. BUT in my defense that was before school started. This is one that the both boys and girls love to read. I’ve got quite the wait list for this one. Ok, I showed you mine, now you show me yours. What are YOU reading? Or have I tempted you with any of these? If you want to help give my students more books to choose from, check out my Project for getting 25 new books here. I only need $120!